At the southernmost extremity of Black Marsh, the region informally known as Murkmire gradually slopes away from the interior uplands of the north until it fades into the ocean. Legend holds that the land once extended much further south before it sank beneath the waves. Murkmire is a region situated in southernmost Black Marsh, south of Shadowfen. The region is largely made up of marshland surrounding the Keel-Sakka River, and is home to the little-known Naga. The city of Lilmoth by the Oliis Bay can be found here, and the region is inhabited by various creatures, such as haj motas, kotu gava, and hackwings. There is also see some exotic and previously unknown flora in the region such as catapult cabbages, scuttle blooms, static pitchers, and voriplasm. Murkmire was released on October 22, 2018 on PC/Mac and on November 6, 2018 on PS4/Xbox One. It was available for free from the November Daily Rewards. A prologue to Murkmire became available to players on October 8th. In the prologue, you meet a society of relic hunters called Cyrodilic Collections. They will need your help in hunting down a dangerous Argonian relic before their competitors find it. The prologue contains two story quests and six repeatable quests. A Life in Carvings: Honor a dead Moss-Skin tribesman by recovering his grave-stake. Art of the Nisswo: Help a priest of Sithis create a work of art. The Assassin's Arbitration: Assist in investigating a land claims dispute for a retired Shadowscale. The Burnt Branch: Recover an old Argonian's priceless keepsake. 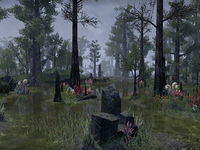 Death-Hunts: Get started on the challenging Death-Hunts in Murkmire. Empty Nest: Investigate strange occurrences at the Bright-Throat egg nursery. Frog Totem Turnaround: Find the author of a romantic poem. Lost in Murkmire: Aid a pair of wayward Dunmer tourists from Vivec City. The Lost Legion: Discover the grisly fate of the Imperial Ninth Legion. Monument of Change: Help restore an ancient Argonian calendar. Ritual of Change: Repair the restored Argonian calendar through ritual. The Skin Taker: Track down a serial killer in Murkmire. Unsuitable Suitors: Investigate the hold up of the bonding ritual at Bright-Throat Village. Grave Circumstances: Banish a necromancer on behalf of the Naga-Kur. Grave Expectations: Purge the corrupted roots of Bok-Xul on behalf of the Naga-Kur. Grave Mementos: Banish a necromancer and collect the bones of fallen Naga-Kur warriors. Old Baubles: Kill a powerful miregaunt and collect some antiquities. Old Enemies: Kill a powerful miregaunt and burn some supply caches. Antique Armor: Salvage old Imperial armor for Cyrodiilic Collections. Grave Subject Matter: Collect the remains of sacrifices from an old temple. Old Scrolls: An Imperial patron has requested the retrieval of intelligence from the ancient Ninth Legion. Sacred Candles: An Imperial patron wishes to carry out a benevolent Argonian rite for long-dead soldiers of the Ninth Legion. Tools of Slaughter: Recover ritual objects from a temple to Sithis. The Weight of Words: Retrieve the writings of Sithis for further study. Reaching some areas in this zone requires the use of the Fire Rock memento, which can be obtained by completing the quest Death Among the Dead-Water. Murkmire was originally announced as a 4-player Adventure Zone similar to Craglorn, prior to Tamriel Unlimited, but was reworked into a DLC story zone. This zone was originally intended to be located in western Black Marsh, just south of Shadowfen, and include the city of Gideon—as made clear by both official and datamined pre-release information. This version of the zone had three geographic regions consisting of swampland in the north, uplands in the center, and bogs in the south. It was at some point decided that the zone should be moved to southernmost Black Marsh instead, with a different geographic composition. Rounds three and seven of the Maelstrom Arena are themed after Murkmire, while the Blackwood Borderlands use many of the same assets. The Grand Topal Hideaway house also uses the "Murkmire" architecture style. A number of books relating to Murkmire, such as The Blackwater War, An Orc Weaponsmith In Murkmire, and Tribes of Murkmire, were datamined prior to the DLC's redesign. An Orc Weaponsmith In Murkmire and Tribes of Murkmire in particular were altered to replace mentions of Gideon with Lilmoth, and the former was even renamed to From Wrothgar to Lilmoth: A Smith's Tale.